Jerar Encarnacion was three of the LumberKings 20 strikeouts in Tuesday night's loss to Quad Cities. 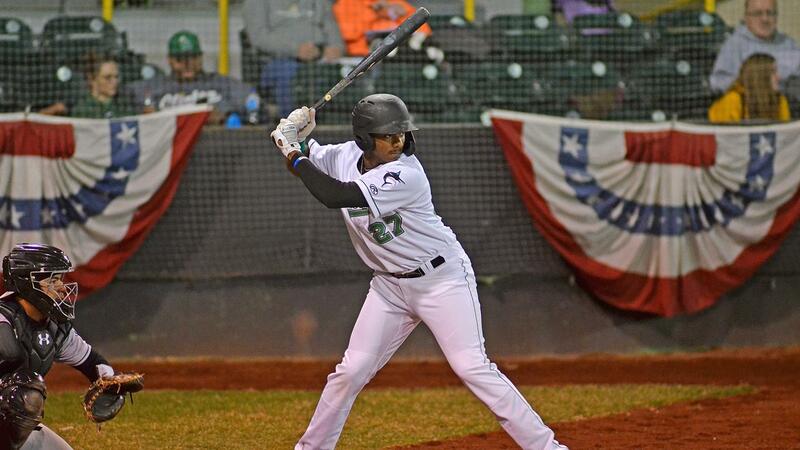 CLINTON, IA (April 9, 2019) - Clinton LumberKings hitters went down 20 times by way of the strikeout in a 2-0 loss to the Quad Cities River Bandits on Tuesday night. Strong performances from Chris Vallimont, Sean Guenther, and Steve Farnworth went to waste for the LumberKings (2-4) in their third straight loss. Quad Cities (3-3) scored the only runs of the game early. In the top of the second, Scott Schreiber singled to open the inning, moved to second on a Marty Costes single, and took third on a wild pitch. Andy Pineda then scored Schreiber with a sacrifice fly to left that would be all the River Bandits needed. Vallimont (0-1) allowed the final run of the night in the following inning. With one out in the top of the third inning, Ross Adolph drew a walk and scored three pitches later on a Jeremy Pena RBI double into the left field corner. Clinton failed to back their starting pitcher with any support as they struggled to put pressure on Quad Cities starter Austin Hansen and reliever Shawn Dubin. Hansen ended his night with 11 strikeouts and no walks to earn his first win of the year. Bubba Hollins had both of the hits recorded against Hansen (1-0) but the LumberKings failed to get two men on in the same inning against him over his five innings of work. Dubin was the only other arm used by the River Bandits and continued the theme of strikeouts. Over his four inning outing he struck out nine while walking none and holding the LumberKings scoreless. Clinton's only rally of the game came in the bottom of the ninth following three straight singles that loaded the bases with one man out. Hollins popped out for the second out of the inning and Dubin struck out Demetrius Sims to end the game and give the River Bandits 20 strikeouts for the night. The LumberKings franchise record for strikeouts in a game was in danger to be broken. 1965's Clinton C-Sox struck out a record 21 times on July 28th to establish the current franchise mark. The LumberKings will play game three of their four-game series with the Quad Cities River Bandits on Tuesday night. Clinton will give the ball to righty Josh Roberson (1-0, 0.00) while Quad Cities will counter with right-handed pitcher Nivaldo Rodriguez (1-0, 0.00). Tuesday will be the first "Retro Beer Night" of the year. Come down to the ballpark and enjoy select retro beers at the groovy and far out price of just $2.